The Penguins battled hard against the Bruins in spite of coming into the game minus five regulars from the lineup and then losing defenseman Brooks Oprik to injury during the opening frame, as well as making the cross-country flight from California where the Penguins played three quality opponents in a five-day stretch. Boston controlled the action in the first period but the Penguins responded by getting the better of the Bruins over the final 40 minutes, doing everything except getting the puck behind Tim Thomas. Pittsburgh outshot the Bruins, 25-19, after the opening period and appeared to get to the net and wreck havoc around the crease more often than they have in recent games. Coming home to a raucous backing at Mellon Arena on Thursday night against the New Jersey Devils will allow the Penguins to get their offense back on track. BOSTON (AP) – Tim Thomas stopped 27 shots for his second shutout of the season, and Sidney Crosby was held without a point for the fifth straight game as the Boston Bruins beat the Pittsburgh Penguins 3-0 on Tuesday night. Matt Hunwick backhanded a rebound under the crossbar, then had to wait 77 seconds for a whistle so NHL officials could consult a video replay and give Boston the goal. Mark Recchi had the 900th assist of his career, Daniel Paille had his first goal with the Bruins, and Patrice Bergeron added a short-handed empty-netter with 3.5 seconds left as Boston won back-to-back games for the first time all season. One reason to expect the Penguins to soon break out of their offensive slump is the way they have been able to continue having success working over opposing defenders by virtue of their power-cycling game. Physical forwards Jordan Staal, Bill Guerin and Chris Kunitz were especially effective down low. Watching their teammates succumbing to injuries on what feels like a per-game basis these days does more than just deplete the lineup. After a while such adversity can only begin to wear mentally on the troops left behind as they feel the pressure to compensate for the missing offensive and defensive production. Marc-Andre Fleury was pulled during the Penguins’ 5-0 loss to San Jose on Saturday but he came back against the Bruins with a fine effort to keep Pittsburgh in the game all evening, particularly in the first period when the Bruins held a 10-2 advantage in shots. Fleury stopped 26 of 28 shots overall. His biggest save occurred with 5:21 remaining in the third period when he used his catching mitt to deny David Krejci’s chance from eight feet away to give the Penguins hope coming down the stretch. Boston struck first following a scoreless first period as Matt Hunwick skated the puck from behind the Pittsburgh net and unleashed a backhander over the shoulder of Marc-Andre Fleury and under the inside crossbar. Play was originally allowed to continue but at the next stoppage replays confirmed Hunwick’s shot hit the inside of the net. Boston 1, Pittsburgh 0. 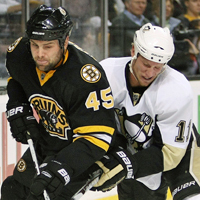 The Bruins turned defense into offense when Derek Morris broke up a centering pass from Matt Cooke to Sidney Crosby. Patrice Bergeron moved the puck ahead to Mark Recchi, who found Daniel Paille behind the Penguins’ defense. Paille beat Fleury to the blocker side. Boston 2, Pittsburgh 0. Bergeron closed out the scoring with four seconds left in regulation as his shot from the opposite end of the rink during a Penguins’ power play bounced twice off the ice before landing into the empty net for the score. Boston 3, Pittsburgh 0. For the second-consecutive game the Penguins suffered an injury on the blue line and were forced to spend a majority of the evening with just five defenders as Brooks Orpik did not return after running into David Krejci behind the Penguins’ net during the first period. Orpik will be evaluated on Wednesday. Deryk Engelland made his National Hockey League debut against the Bruins in place of the injured Kris Letang after being recalled from Wilkes-Barre/Scranton on Saturday. Engelland was even in 19:20 of ice time and led the Penguins with five hits. Head coach Dan Bylsma shuffled his lines before the game and saw positive results from two despite the lack of goals. The line with Jordan Staal centering Chris Kunitz and Bill Guerin combined for eight shots on goal and provided a presence in the Boston zone almost every time they took the ice. Craig Adams’ line with Pascal Dupuis and Chris Conner supplied plenty of energy as they used their collective speed to force turnovers and create offense from below the goal-line. > Despite their recent struggles the Penguins’ 12-6 record through 18 games keeps them at the top of the Eastern Conference standings tied with the Washington Capitals with 24 points. > The Penguins are now 30-9-4 in the regular season since head coach Dan Bylsma took over. They have a record of 15-5-3 on the road. > With Orpik playing only 2:23 several defenders again stepped up to log major minutes. Alex Goligoski led all skaters with 28:25, followed by Martin Skoula (24:27) and Mark Eaton (22:24). > Alex Goligoski is tied for third in the league with a plus-12 rating through Tuesday’s early games. Goligoski is tied with Calgary’s Dion Phaneuf and Atlanta’s Zach Bogosian for the league-lead among defensemen with six goals. > Jay McKee moved within one of the league lead in blocked shots after stepping in front of one Bruin shot. McKee has 56 blocks compared to 57 for Brett Clark of Colorado. > Former Penguin Mark Recchi picked up his 900th career assist when he set up Daniel Paille’s goal 3:34 into the third period. 3. M. Hunwick "We've got to find a way to score some goals ...We've got to find a way to play better."